Underwater wireless communications links have almost exclusively been implemented using acoustic systems. Optical links have proved impractical for many applications. Although underwater radio links were experimentally evaluated in the pioneering days of radio, they did not meet the requirements of the time. Given modern operational requirements and digital communications technology, the time is now ripe for re-evaluating the role of electromagnetic signals in the underwater environment. Underwater electromagnetic communications have been investigated since the very early days of radio, and again received considerable attention during the 1970s. Then terrestrial radio typically delivered manual digital communications (Morse code) or full bandwidth analogue voice communications over long range, and research was aimed at delivering these types of service in the underwater environment. In fact, the Extremely Low Frequency (ELF) submarine communications system is believed to be the only successfully deployed subsea electromagnetic application. This system operated at 76Hz for the US system and 82Hz in the Russian system and allowed transmission of a few characters per minute across the globe. It implemented a one way 'bell ring' to call an individual submarine to the surface for higher bandwidth communications using terrestrial radio. Through water, full-bandwidth, long-range, analogue voice communications were found to be impractical and there rapidly developed a 'perceived wisdom' that electromagnetic signals had no applications in the underwater environment. In the digital era we have become familiar with the benefits of short-range, high-bandwidth communications systems such as Bluetooth. At the same time, the oil industry and military operations have changing requirements that have created demand for reliable, connectorless short-range data links. An initial investigation revealed that electromagnetic signalling, coupled with digital technology and signal-compression techniques, had many advantages that made it suitable for niche underwater applications. Electromagnetic propagation through water is very different from propagation through air because of water's high permittivity and electrical conductivity. Plane wave attenuation is high compared to air, and increases rapidly with frequency. With a relative permittivity of 80, water has among the highest permittivity of any material and this has a significant impact on the angle of refraction at the air/water interface. Above 10kHz, electromagnetic propagation is more than a hundred times faster than acoustic. This has import-ant advantages for command latency and networking protocols, where many signals have to be exchanged. Doppler shift is inversely proportional to propagation velocity, so is much smaller for electromagnetic signals. Another important consideration is the effect of the air to water interface. Propagation losses and the refraction angle are such that an electromagnetic signal crosses the air-to-water boundary and appears to radiate from a patch of water directly above the transmitter. The large refraction angle produced by the high permittivity launches a signal almost parallel with the water surface. This effect aids communication from a submerged station to land and between shallow submerged stations without the need for surface repeater buoys. The air path can be a key advantage. For example, if two divers are 1km apart at 2m below the surface, attenuation will be significantly less than anticipated from the 1km through-water loss. In comparison, acoustic signals cannot cross the water-to-air boundary, so 1km through-water loss would apply. A similar effect is seen at the seabed, where conductivity is much lower than the water. The seabed is an alternative low-loss, low-noise, covert communications path. Figure 2 illustrates the propagation paths that can be exploited for communications. In many deployments a single propagation path will be dominant. Submarine ELF systems use line antennas trailed by the vessel while submerged, but this system implements ‘receive’ only at the submerged node. Magnetic coupled loop antennas are the most compact practical solution for duplex submerged systems. Loop antennas are directional in nature and this property can be exploited to allow selection of a single propagation path. Alternatively, omni-directional antennas can be implemented by crossing two loops so that their planes intersect at right angles. Underwater electromagnetic signals have a range of practical applications in navigation, sensing and communications. Short-range navigation systems can be based on the signal magnitude gradient seen in electromagnetic propagation. For beacon applications, sonar systems must use phase information to sense wave-front direction, and suffer from multi-path effects and pressure gradients. 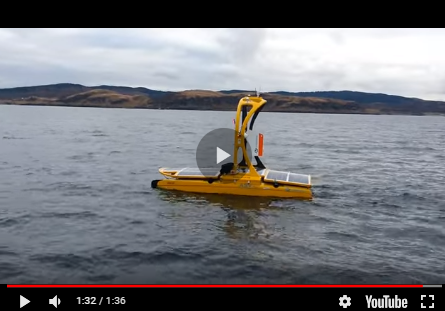 UUV navigation systems based on electromagnetic signals will measure increased signal strength as a direct response to movement towards a beacon, which will enable a very simple, robust control loop. Distributed cables can be designed to radiate an electromagnetic signal along their length. This type of distributed transducer has no equivalent in the acoustic domain. A cable can provide short-range navigation and reduces the range required for mobile communications. This arrangement allows implementation of a 'tram-line' that can be tracked by UUV while allowing periodic excursions. A continuous tram-line is easily intercepted on the UUV's return. Bandwidth only exceeds that possible using acoustics at very short range. In most applications it is the unique propagation mechanism that delivers a host of niche advantages to complement the use of existing underwater systems. no known effects on marine animals; effect of acoustic signals on marine mammals is becoming an issue. Wireless Fibre Systems (WFS) has been exploring this area of technology for over two years, in collaboration with a number of government bodies including the UK National Physics Laboratory, several univer-sities and industrial partners. This area has been largely neglected in the digital communications era and WFS has filed ten related international patent applications covering communications, navigation and sensing. Experimental work began in 2004 and has progressed from fundamental propagation experiments through data transmission demonstrations to the point of launching our first communications products in the third quarter of 2006. WFS is currently developing two product ranges of underwater telemetry links. In September 2006 we launched the S1510 underwater em modem. This system has been designed to transmit signals of up to 16kbps over 20m in seawater. At lower data rates, signals can be transmitted over 200m. The S1510 can provide periodic two-way telemetry updates during a one-year deployment powered from a small battery pack. This product has been targeted at a variety of applications such as environmental monitoring, AUV real-time control, data harvesting from underwater sensors and diver communications. Electromagnetic communication links are particularly suited to shallow-water applications where difficult conditions apply or where non-obtrusive solutions are required, such as in rivers, estuarine waters, in harbours or around industrial facilities on the coast or offshore. Signals pass through ice with low attenuation, so all-year data collection is possible even when surface water is frozen. The end of 2006 will see the launch of the S5510, a broadband electromagnetic telemetry link aimed at customers who require transfer of large amounts of data (1-10Mbps) over short distances (<1m) under water. This has been designed to support the rapid harvesting of data from underwater sensors by UUVs, with-out the need for a hard docking and at very high Joules-per-bit efficiency. It provides duplex operation with Ethernet bridge functionality. In practice, each deployment has unique requirements. While the S5510 and S1510 platforms provide the bulk of the system functionality, each solution has uniquely to balance parameters such as antenna design, transmit power, duty cycle, data bandwidth, antenna size and local noise sources to achieve an optimised solution for the specific application. Communications technology and operational requirements have radically changed since underwater electromagnetism was first evaluated. Wireless Fibre Systems has pioneered commercial developments in this area and has launched the world’s first underwater em communications product with unique capabilities. We believe the impact of this technology will prove disruptive in a broad range of industries, including defence, offshore oil & gas and environmental monitoring.